11-year-olds are notoriously problematic — or at least I think so, having worked with unruly preteens as a lifeguard and summer swim instructor back in the day. Now that The Brothers Brick is a tween, you never know what trouble we’ll get up to. One of the things that frequently lies ahead of the tween LEGO builder is that he or she will enter what adult builders in hindsight call the “dark ages,” that time in your life when LEGO matters a whole lot less than, well, all the other things that teenagers typically do. The thing is, The Brothers Brick has already been through a bit of a LEGO dark ages, as real life caught up with many of our long-time contributors back in 2013 and 2014. Hey, it happens — we’re all volunteers and our families and day jobs always take priority over LEGO. The good news is that we’ve made a number of significant changes to how we run things around here, and we think you’ll agree. After we wrapped up the Battle of Bricksburg at BrickCon in October, we recruited a cadre of 10 new contributors, from all over the world. Over the years, TBB contributors have hailed from the US, Canada, UK, the Netherlands, Australia, Croatia, South Africa, Turkey, Russia, and Mexico. We feel that it’s important to reflect the diversity of the global LEGO fan community — while we write and publish in English, there are TBB readers everywhere. A few weeks ago we even interviewed a group of LEGO builders and TBB readers in Antarctica! About only bits in the following coverage map that aren’t blue are North Korea, Eritrea, and Western Sahara. 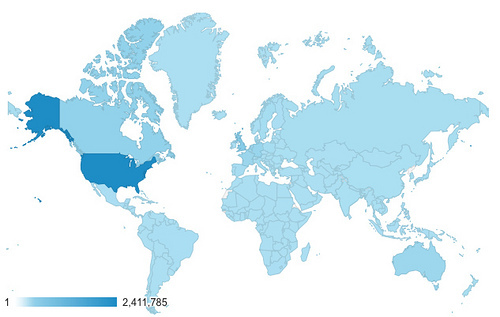 Globally, that’s more than two million people who visited Brothers-Brick.com over the past 12 months. 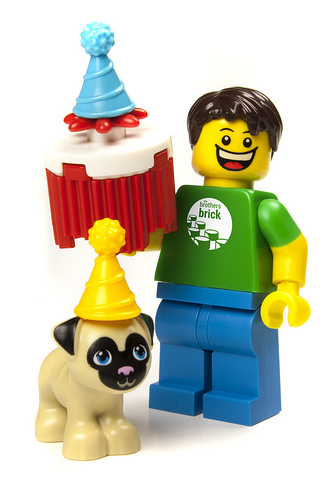 As the LEGO fan and builder community expands, it has diversified from LEGO strongholds such as Flickr to sites such as Instagram, Tumblr, and Pinterest. Understanding this, we’ve invested in expanding our social media presence, and the numbers don’t lie — we’re meeting LEGO fans wherever they are. In the 12 months between July 2015 and today, our fans on Facebook have grown from about 8,000 to over 42,000. Back in January, we discovered that there’s a massive audience for LEGO on Pinterest, and we’ve gained 4,000 followers there in barely six months. Every month, more than 4 million people see pins from The Brothers Brick on Pinterest! So, if you think you’re the only LEGO fan in your town, you’re definitely wrong. Go out and get involved in your local LUG, attend a convention, and start sharing those amazing builds you’ve just been posting online. We also implemented some behind-the-scenes changes, including a new communication platform that just about everybody is using these days, Slack. Contributors collaborate in real time with the editorial team, and we coordinate publication at the most optimal times over the course of the day, with a light edit pass to ensure we’re publishing the best content possible. There’s still a lot we could be doing better, though. I’m still not satisfied with the thoroughness of our news coverage — you’ve said you want an informed perspective on the LEGO-related news you’re seeing in the mainstream media, and we’re often too irritated to dignify those stories with smarter coverage. And I’d love to see us producing video content for TBB’s YouTube channel more consistently. We’ll work on both of these areas over the coming year and see where we are in July 2017. Most importantly, I’m not at all happy with how well we’re running our web infrastructure. 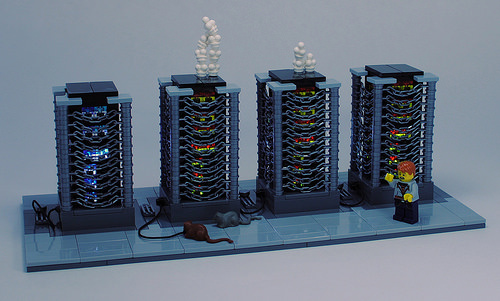 We made light of this last year with the Server Downtime Contest (and ended up bringing on the winner as one of our contributors), but dealing with an hour or so of downtime every three or four months is pretty irritating. Now that I do the math, that’s actually uptime of at least 99.95 percent, but I’d really rather have TBB hosted on an auto-scaling virtual infrastructure like Amazon Web Services, but nobody on the team has the expertise to migrate off our older physical hardware. The good news is we survived our share of viral posts, including Hannes Tscharner’s Millennium Falcon, the first pictures of 42056 Porsche 911 GT3 RS, and D.Va’s mech from Overwatch (which hit the front page on reddit). We’d still like to do even better and not worry every time something starts doing well on Facebook, so if this is your area of expertise and want to help, let us know. But overall, with an average of 5 posts every day from a global team compared to 3 or 4 posts per week from a handful of North American contributors during the first half of last year, I think we’re in a much better place than 2013-2014, as shown by the explosive growth of our readership within the last 12 months. So, we’re certainly feeling your love, and we love you right back! We like to share the love, so don’t forget that we like to give stuff away! We’ve given away the enormous classic Batcave, Millennium Falcon, and right now you can win the Ecto 1 from the new Ghostbusters movie. Thanks for sticking with The Brothers Brick through thick and thin. Happy building! Good to see The Brother’s Brick going stronger than ever now! I cannot believe it, we share the same BIRTHDAY! So I wish you a happy 11th! Myself? today is my 67th am I now a true AFOL? Many more years of excellent service are ahead of you! Nicholas, on behalf of the TBB team, happy birthday! Here’s wishing you lots of pre-sorted LEGO!